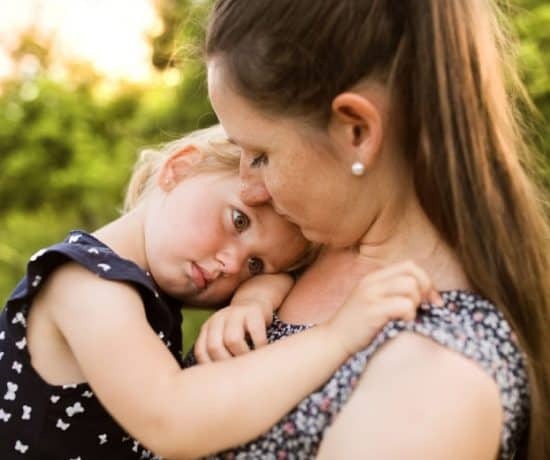 Let’s face it — when it comes to the child-parent relationship, there is one person who has mature self-control and one smaller person with considerably less self-control. The result is that as a parent, we not only have to regulate ourselves, but we also have to help our kids regulate. Kids are literally uncivilized. They don’t know or understand the social rules we have for when and how to express emotions. In fact, that’s what we are faced with teaching them! And we teach them during a time when the regulatory part of the brain is primed to learn and hence, not yet mature or well-connected. It will be quite awhile before our efforts to teach them self-regulation pay off. Depending on age, temperament, and what’s going on in their life our kids are not yet well-equipped to handle disappointment, frustration, to be able to calm down, to focus on a goal, evaluate options or make well-thought-out decisions. But how well-equipped are we? What have we done in our lives before that baby comes to prepare ourselves to handle a being who has little self-control? Well, if you are anything like me — not very. Maybe that is one reason why people say you can never really prepare yourself for having a child — that before becoming a parent you have no idea what it is like to be fully responsible for someone else, to always be thinking of them, to be putting their needs before your own? On the other hand, we’ve been preparing our whole lives for this — our own self-regulation system was highly influenced by our own childhood and our experiences as an adult. Some of us are better regulated by nature, some of us may be better regulated because of experience, but all of us will have to do some work on ourselves and adapt once that baby is born. And then we will have to keep on adapting. As our children grow we will grow also, only our growth will be on the inside. *Note: If you feel like self-regulation is a deeper issue for you, you aren’t alone. This is something that can be improved in therapy or with a parent coach. I am not a therapist and the information here is for educational purposes only. See my parent resources page for more information on how to find a therapist/parent coach. As parents, we often seem to have an instinct for knowing what our children need and yet also we find ourselves befuddled, irritated, and sometimes at a battle of wills with these little creatures who have yet to learn the rules and ways of socialization. Case and point — I dare you to cut a piece of toast or a sandwich into squares when triangles are expected! We talk a lot about the importance of teaching kids self-regulation, but what about our own? How do we develop these skills? How can I teach my son to handle his frustration when sometimes I can’t handle my own? Luckily, our kids having a way of being able to hone in on just what it is we need to work on — they can push our buttons like no other! As if they are Jedi Masters our kids will quickly expose our weak spots and challenge us daily. We simply have to take that challenge and be mindful of it. Zen parents aren’t born, self-regulation is not a skill to master or an inherent trait, but rather a journey within ourselves that can always grow, change, and adapt. There is a lot of information in this post so don’t miss a summary of the five steps included in the printable below. 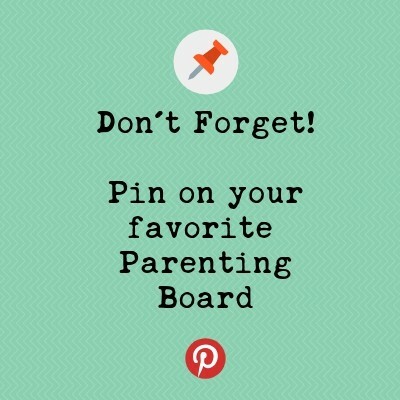 Save this post so you can refer back to it and let’s zen out and travel together on this path of intentional parenting! Like everything on this list, this isn’t something you do once and you are done. Partly because your child is always changing and growing and along with that growth, your expectations of them will change. I am guilty of expecting way too much from my son. It’s easy to do — he’s tall for his age and incredibly verbal. I have to constantly remind myself — he’s a child, he is expected to act out of control, impulsive, and overexcited. I have to remind myself (and even my son’s teachers have reminded me) that his physical and cognitive development doesn’t match his social and emotional development. And that’s okay — in fact, it’s developmentally appropriate. Wherever your child is developmentally, is simply where they are. As parents, we certainly help them develop, but we have to accept where they are too. Children will be more emotional than we are. With limited regulation skills and constant cognitive leaps, they are bound to have bad days. Remind yourself that self-control skills are not organized in the brain until the age of three and not mature until the age of 5 or 6. There is continuous development throughout childhood and then a second major growth spurt of self-control in the brain during adolescence. Some estimates place final maturation at the age of 30. And then if you become a parent, a whole new stage of self-regulation maturation begins — the ability to regulate yourself and another. So, how do we reframe? The next time your child screams because you cut the toast wrong, yells because they can’t get the Lego structure right, has a breakdown after school, or starts whirling around in a ball of emotions for seemingly no reason — just look at them and observe. Observe them as if they are from another planet because, in a way, they are. Remember that their brains aren’t like ours yet. See their smallness. Observe with open curiosity and really see them. Once you really look at them, you’ll begin to empathize with this little being who just can’t even right now. 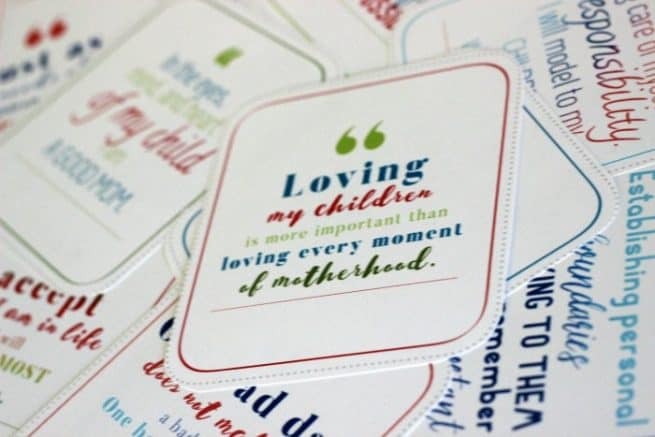 Print out inspirational quotes to remind yourself to be open to their bad days, crankiness, and lack of regulation, stick them around your house to help you remember to adjust your expectations and see you child for where they are in that moment. It sounds so simple, yet it is so profound. It’s also hard to do. When our kids go crazy, it triggers a stress response in us that can be worse if it’s in public. This is true for me, but I have also had times when I’ve kept my calm. I have simply responded instead of reacting to their needs and with my own emotions under control. When I do that it is so much easier. Easier to help them cope and easier to move onto the next thing unencumbered. How can you do this? Like all of the other steps, it’s a process. But you have already started to stem your own emotions with step one, changing your expectations. The next step is to identify your triggers. “Self-monitoring” is often one of the first steps in building parental self-regulation. Start keeping a list of your triggers. What sets you off? For me it’s noise, the louder it is the harder it is for me to keep my calm. And also when other people are affected, so I tend to start stressing when we are in public. At these times I need to brace myself for my son’s emotions — I have to get centered. When you feel yourself start to react, have a mantra at the ready (which has been shown to calm the brain in imaging studies) — take a breath (a proven way to halt the stress response) and say a simple phrase to yourself. Something that steadies you or calms you. Here are a few examples. I find that it is helpful to physically root yourself or center yourself as you do this. Engage your core (which also has a physiological calming effect) and plant your feet firmly on the ground, open and facing your child. Take a deep breath and say your mantra to yourself. Now you are in a place of strength to weather their storm. Want more Mantras? I love these positive affirmation cards (referral link). Print them out and shuffle through them — stick one on your mirror, one on your fridge, and one on your computer– little reminders to be present, loving, and centered. How you handle your little one’s regulation problems is intertwined with your own regulation. If you have a plan for how to handle these situations you will feel better equipped. If you feel better equipped, you will be better regulated. Also, you are helping them learn to regulate themselves, right? I think that our own regulation is completely tied to our ability to teach regulation to our children. The two systems must be connected in our brains and I know our kids won’t be able to regulate if we can’t. My sister is the one who first said the words “my parenting toolbox” to me. She was talking about how she felt better able to handle emotional meltdowns or difficulties when she had strategies in her back pocket. She is always looking for new “tools” to have handy and I am too. If you are regulated and responding instead of reacting to your child, you will already be more effective in helping them. 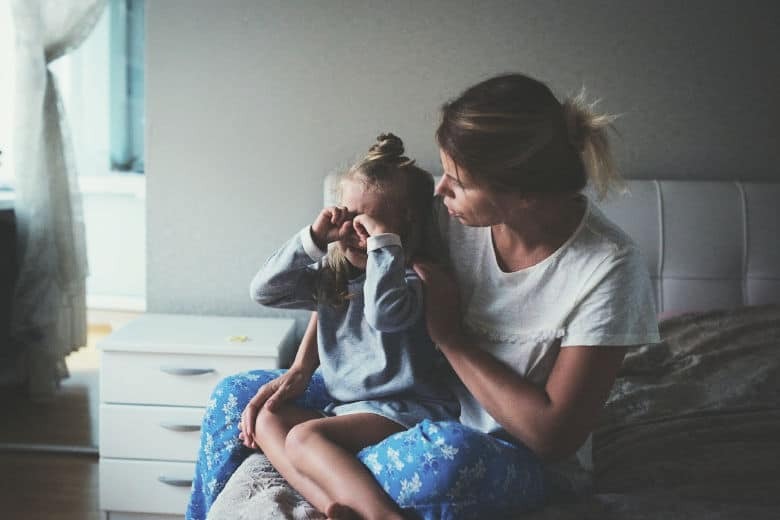 The next step is parental self-efficacy — or how confident you feel in your ability to positively impact your child’s behavior and development. I know I feel more confident when I have a plan and when I have intentions for how I am responding to my child. Don’t know where to start? 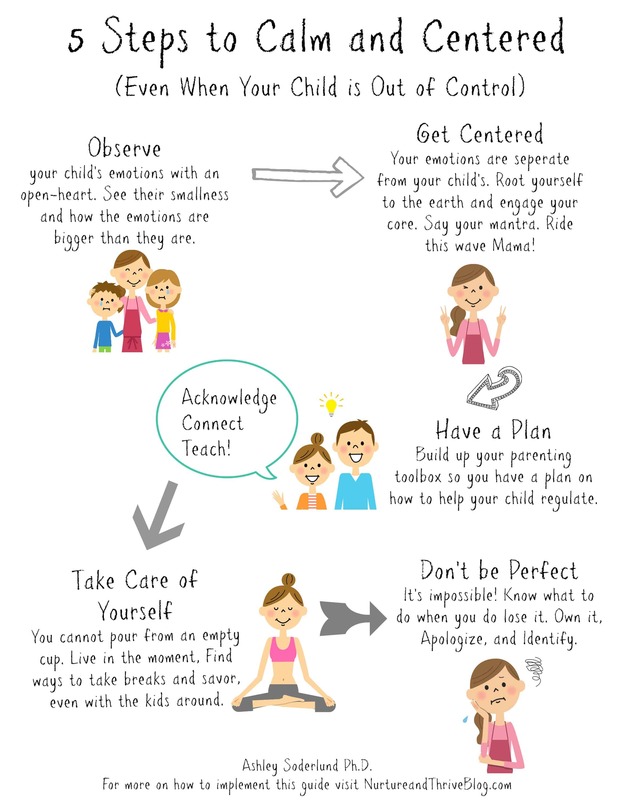 Here is my 3-Step plan to respond instead of reacting to your child: Act: Acknowledge, Connect, Teach. Here is another way to get started. Identify a trigger or stressful situation — lately morning routines have been stressful for us and I find myself lacking patience. I started by trying to figure out why I was stressed. My son was waking later and later and we had less time. He was also less focused. So, I started waking my son up a little earlier, which also meant making sure he was getting to bed on time. I also created and printed out a morning routine chart to help keep him on task. Having a plan made me more intentional, instead of just reacting to the situation and hence, better able to stay calm. These responses are so insightful. Yes, we may feel empowered, but staying calm takes a toll. It’s harder when we ourselves are tired or stressed. We only have so much in our emotional reserves. When we feel our reserves dwindling we need to take the time to take care of ourselves. Part of it is truly taking a break when we need it. I have to admit, I’m such a work in progress on this one (and even if I do take a break, I feel guilty about it)! 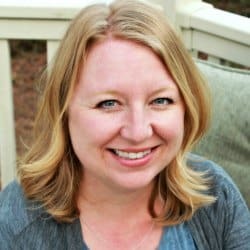 Amanda Rue from Dirt and Boogers has some great practical advice on how to take a break, even when you are home with the kids and even when they are crazy! No more excuses: Take a Mom Break, Without Your Kids Driving You Batty. And here are 100 Self Care Ideas That Will Fit Easily into Your Busy Schedule from A Fine Parent. And part of it is being able to live for the moment. Finding joy in the mundane and in your everyday routine will lift you. It’s both easy and hard to do with kids. On the one hand, when I stop trying and I start just being with them they open up such a magical place. On the other hand, children are repetitive, less regulated, and demanding. So, part of it is perspective. I have no time or room for an entire day to be a “bad day.” I will have bad moments, but to waste an entire day on it isn’t worth it. How would I have felt if my day before my accident was a “bad day” and I didn’t pull through? How would that leave my friends and family? It’s not worth it. Have a bad moment, and move on. — Amy Van Dyken-Rouen, Today, December 2014. Own it — Admit that you lost your temper or got frustrated. Apologize — Sometimes parents make mistakes too. Identify — Tell your child what it was you did to calm down. I got really mad, didn’t I? Sometimes parents feel angry too. Everyone has feelings. I yelled at you and I shouldn’t have done that. I’m sorry I hurt your feelings. But then, I took some deep breaths and I calmed down didn’t I? I love you and I will work on not losing my temper. This is great on so many levels — it shows that everyone makes mistakes, but that mistakes can be overcome. It allows your child to develop forgiveness and empathy. It allows you to model some self-regulation and makes you aware of your weak spots or trigger points. 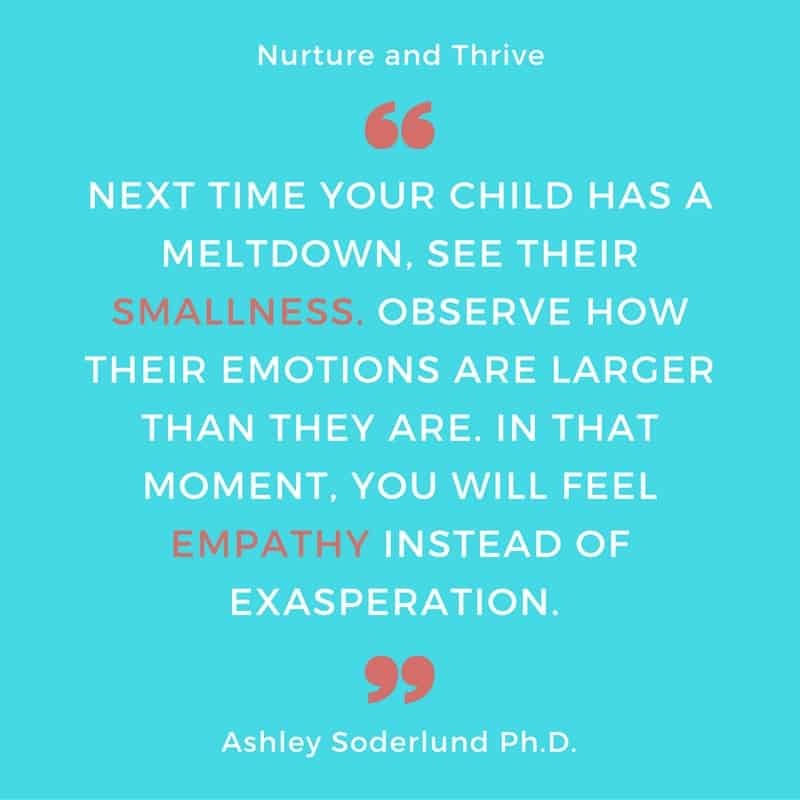 It also makes you conscious of your regulation tools or skills so that you can suggest them to your child when they are upset. And finally, it is helping you child practice healthy relationship skills. For more on what to do after you lose it and another awesome printable, check out the Idealist’s Mom’s Magic 5 :1 Ratio. Just remember, this is a journey, not a destination– one we parents are all on together. 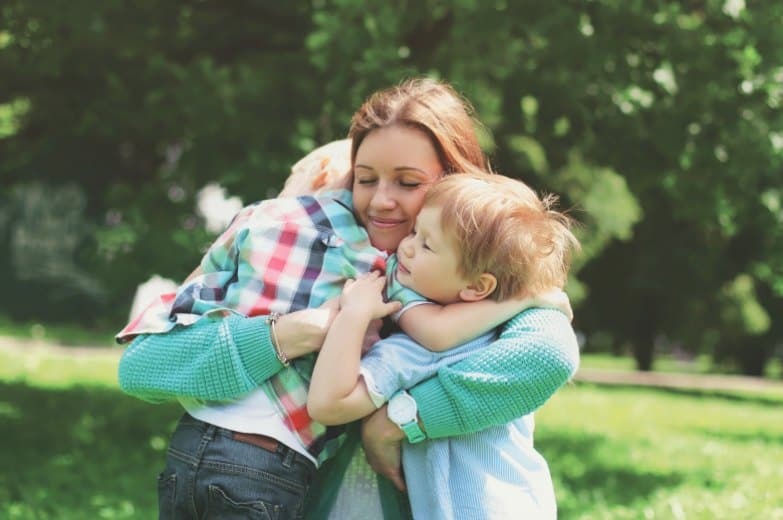 So, if you see me in the preschool parking lot calmly handling my son’s breakdown, applaud me and if you see me flustered and frazzled, sympathize — I promise, I’ll do the same for you. Looking for even more ways to remain calm? 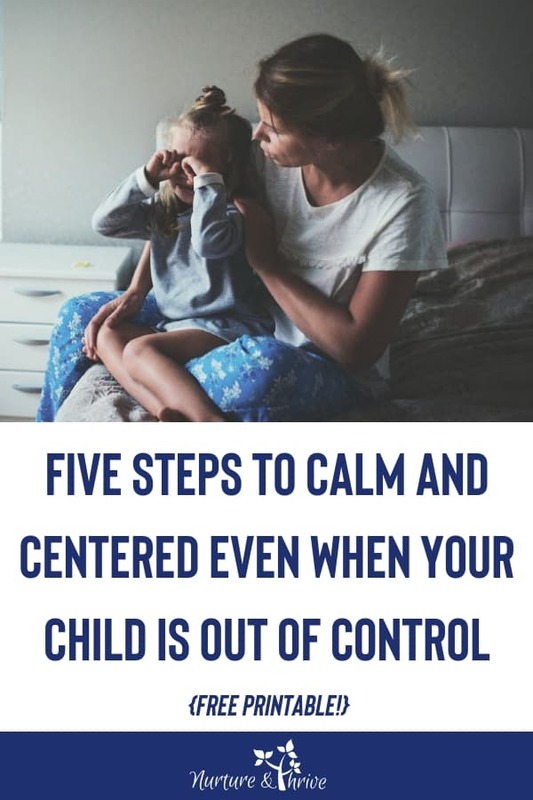 Check out this great list of 25 simple Ways to Remain Calm Even When Your Child is Not and this secret way to stay calm from Janet Landsbury, Tantrums and Meltdowns — My secret to staying calm when my kids aren’t. I am a developmental psychologist with a passion for understanding how young children learn to deal with stress and emotions. Once I became a mom, I was overjoyed and found myself facing my hardest job yet. Join me on my quest to understand children's emotions, behavior, and how best to support their development! Let’s nurture them and watch them thrive! 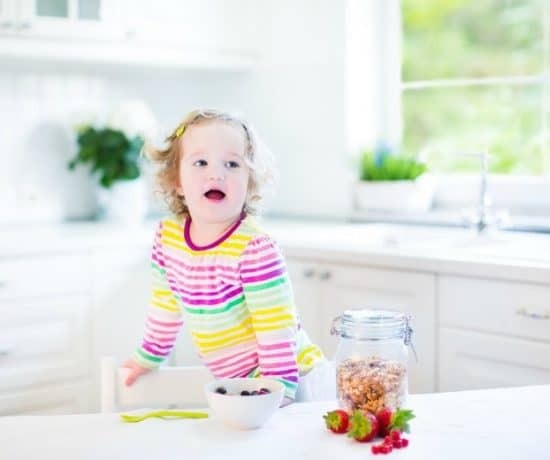 Four Mealtime Strategies for Kids Who Won’t Sit Still! One of the challenges in parenting,to be calm while your child is out of control. Well,test of temper and patience.